Arthur Blythe-Elaborations, Light Blue: Arthur Blythe Plays Thelonious Monk and Put Sunshine In It. After spending the rest of 1979 and all of 1980 working as a sideman, this allowed Arthur Blythe to get over the commercial failure of Lenox Avenue Breakdown. He returned in 1981 with Illusions, an album of innovative and inventive jazz that featured a composer, bandleader and musician at his creative zenith. Sadly, just like his two previous albums for Columbia,Illusions failed to find an audience. This was another disappointment for Arthur Blythe. Despite that, Arthur Blythe headed back into the studio with some top session players. The result was Blythe Spirit which was released in 1981 to the same plaudits and praise as its three predecessors. So much so, that many critics regarded it as one of the finest albums of his time at Columbia. Arthur Blythe had hit a rich vein of form musically, and he hoped that this would continue. He also hoped that his music would start to find the audience it deserved. Buoyed by releasing a quartet of critically acclaimed albums, Arthur Blythe’s thoughts turned to the future, and what would be the seventh album of his career,… Elaborations. It’s one of a trio albums that featured on BGO Records’ recently released and remaster two CD set. 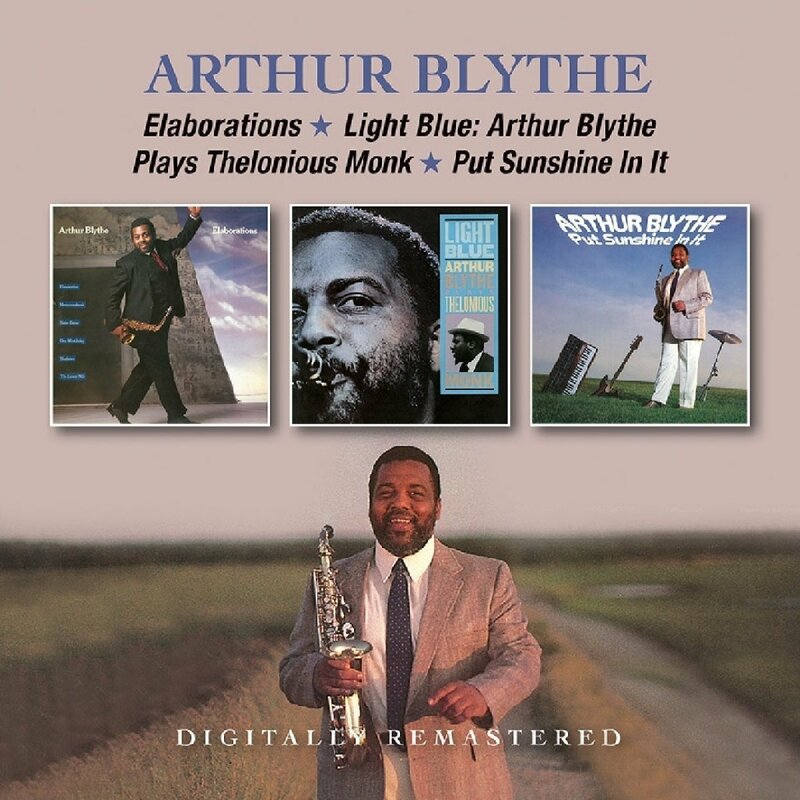 It features Elaborations, Light Blue: Arthur Blythe Plays Thelonious Monk and Put Sunshine In It which continues Arthur Blythe’s Columbia years. Arthur Blythe’s recording career only began in 1977, and since then, he had been making up for lost time. Before joining Chico Hamilton’s band in 1975, Arthur Blythe was working part-time as a security guard in New York. Now just seven years later in 1982, and Arthur Blythe was about to record the eighth album of his career. It was an incredible change in fortune, and Arthur Blythe was determined to make the most of every opportunity that came his way. 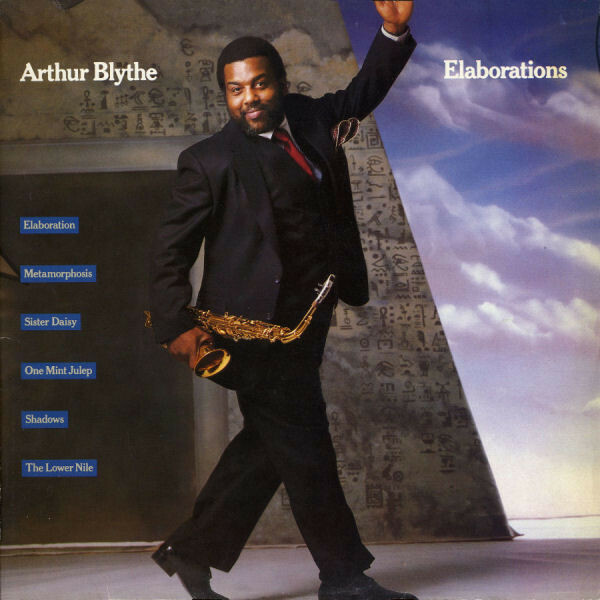 Arthur Blythe stayed true to his musical philosophy on an album that not only referenced hard bop and avant-garde, but R&B. It’s a captivating musical journey from the opening bars of Elaborations, where Arthur Blythe’s blazing saxophone soars powerfully above the arrangement. Later, the rest of the arrangement becomes fluid, meditative and laid-back. Still, Arthur Blythe plays with power and passion, but later leaves space for the solos before his sultry saxophone returns as this masterclass takes shape. This sets the bar high for the rest of Elaborations. Metamorphosis is a reworking of a track from his trio live album Metamorphosis. It’s transformed by the quintet, taking twists and turns as Arthur Blythe unleashes impressive sheets of sound as he plays with speed, power and precision. Sister Daisy is a catchy with the band playing as one while Arthur Blythe’s craggy, jaggy and melodic. Arthur Blythe’s love of R&B is especially apparent on One Mint Julep where he throws a curveball on this irresistible and memorable track. Very different is the dark, moody and broody Shadows where there’s a sense of foreboding as this cinematic track moves from jazz in the direction of avant-garde. It’s one of then highlights of Elaborations. The Lower Nile closes Elaborations, and features a myriad of Middle Eastern sounds that add to this powerful and poignant track that is rich in imagery. Elaborations was an impressive addition to Arthur Blythe’s CV. Light Blue: Arthur Blythe Plays Thelonious Monk opens with We See, which is one of Monk’s best known and best-loved songs. Jazz meets Latin as Arthur Blythe’s sultry sax twists, turns and soars while a cha-cha rhythm provides the heartbeat to the liquid arrangement. The result is a joyous and melodic jazz standard. Light Blue is a late-night, ruminative ballad that will strike a chord with the newly heartbroken. Off Minor might be one of Monk’s oldest compositions, but this irresistible bop influenced track sure packs a punch and swings. Off Minor is another of Monk’s older pieces which he penned with drummer Kenny Clarke. In Arthur Blythe’s hands, this melodic track takes on a lively, self-confident, Latin-tinged sound that almost heads in the direction of funk. It also features Monk’s trademark jaunty chromic melody. Coming On The Hudson is a quite beautiful track Monk wrote whilst looking out of a window at the Hudson River. It features loose, laid-back and relaxed performance on what’s one of the album’s highlights. Nutty is an upbeat track where Arthur Blythe’s playing is quick and confident as the shuffle beat ensures the songs swings and then some. In doing so, Light Blue: Arthur Blythe Plays Thelonious Monk closes as it began on a high. 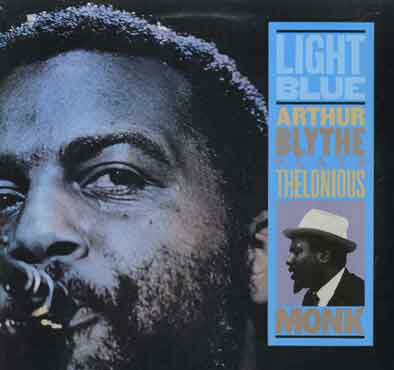 After critically acclaimed reviews that had preceded Light Blue: Arthur Blythe Plays Thelonious Monk, the album was released by Columbia in 1983. Sadly, it followed in the footsteps of his previous albums, and failed to find the audience it so richly deserved. By then, Arthur Blythe and executives at Columbia knew something had change. It was as if Dr. George Butler was planning to market Arthur Blythe as Columbia’s equivalent or answer David Sanborn. What Dr. George Butler failed to grasp was that Arthur Blythe had no wish to be a David Sanborn clone. He would rather have left this to lesser musicians, lacking in pride and self-worth. However, after releasing six album that hadn’t reached a wider audience, Arthur Blythe delivered the album Columbia wanted. 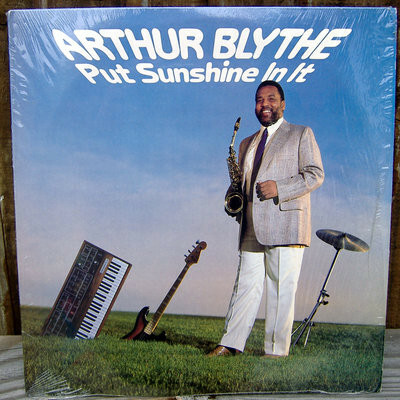 Critics were surprised by the direction that Arthur Blythe’s music had headed in on Put Sunshine In It. Some welcomed the stylistic change, but many critics and commentators recognised that Arthur Blythe’s playing was still of the same high standard on an album that was a marriage of his acoustic band and the latest musical technology. Arthur Blythe had been encouraged to make use of technical tracery and overdubbing, which was a first for him. The result was a jazz album that was obviously recorded in the eighties. That is because of the technology used in the making of the album. It has an unmistakable eighties sound. Having said that, Put Sunshine In It has aged well, unlike much of the music released in the eighties. There’s a reason for that, Arthur Blythe and his band. Arthur Blythe’s saxophone plays a leading role in the sound and success of Tumalumah. Meanwhile, drummer Bobby Battle puts the eighties’ electronic drums to good effect as Arthur Blythe unleashes a blistering saxophone solo. Put Sunshine In It may not have been the album he wanted to record, but puts his heart and soul into the music. It’s a similar case on Put Sunshine In It, where glistening keyboards provide the backdrop to a sultry saxophone solo that later, soars above the arrangement to this beautiful song. Uptown Strut marries elements of boogie, funk and jazz, which is supplied by Arthur Blythe and his band. Despite this being a stylistic departure for Arthur Blythe and the rest of his band. However, Arthur copes well and his playing is fluid and a mixture of power and control. At the halfway stage, Arthur Blythe was coping well on this adventure in sound. This continued on Silhouette, which relies heavily upon eighties technology, which many critics found soulless when used in any genre. However, it’s put to good use on Silhouette, where Arthur Blythe’s playing fluid, soulful and sometimes funky on one of the album’s highlights. # 5 relies heavily on drums machines and synths, which add a jazzy backdrop as Arthur Blythe’s alto saxophone soars above what’s the most experimental arrangement on the album. Sentimental Walk (Theme-Diva) closes Put Sunshine In It, and shows that not ever song that was made using eighties technology is soulless. Quite the opposite, as Arthur Blythe’s soulful side shines through. In doing so, it’s a case of keeping the best until last on Put Sunshine In It which was Arthur Blythe’s venture into electronic jazz-funk. In some companies this would’ve cost him his job, but Dr. George Butler held onto his position as Columbia’s head of jazz. He had press-ganged Arthur Blythe into recording an album he didn’t want to record. No longer had Arthur Blythe the same artistic freedom that he had enjoyed when Bruce Landvall left Columbia in 1982. Gone were the days when Arthur Blythe could record ambitious and innovative albums where he could reinvent his music on each album. The first four albums Arthur Blythe released on Columbia, 1978s In The Tradition, Lenox Avenue Breakdown, Illusions and Blythe Spirit were released to critical acclaim and were released by BGO Records in 2016 as a two CD set. It was the perfect addition to one of the great jazz alto saxophonists. For many people, this was their introduction to Arthur Blythe. Now a year later, and BGO Records recently release the digitally remastered versions of the next three albums that Arthur Blythe released for Columbia as a two CD set. This set begins with 1982s Elaborations and 1983s Light Blue: Arthur Blythe Plays Thelonious Monk, which were both released to critical acclaim. Put Sunshine In It is a much more experimental album due to the use of the technology. However, it’s stood the test of time and shows another side to Arthur Blythe. Elaborations, Light Blue: Arthur Blythe Plays Thelonious Monk and Put Sunshine In It which feature on BGO Records’ two CD set is the perfect accompaniment to the 2016 set that covered the period between 1978 and 1981. These seven album feature the best music that Arthur Blythe released for Columbia. They’re also a reminder of a legendary alto saxophonist at the peak of creative powers. Sadly, legendary bandleader, composer and alto saxophonist Arthur Blythe passed away earlier this year on March the ’27th’ 2017, aged seventy-six. By then, Arthur Blythe was largely unknown outside of a small coterie of jazz aficionados who appreciated the music of this true jazz great. Hopefully, BGO Records’ recent release of Elaborations, Light Blue: Arthur Blythe Plays Thelonious Monk and Put Sunshine In It as a two CD set will introduce the Arthur Blythe’s rich musical heritage to a much wider audience.